Congratulations to "Taurus" and "Kimberly P", the winners in Winter's giveaway. Thank you to all who participated! The summer of 2012 I had the wonderful privilege to visit New Orleans with a native Louisianian who took me to the best places. I lucked out weather wise those few days I wandered the city’s streets and haunts. And I must say, what a tourist trap, but New Orleans definitely has a vibe all its own. And I loved every minute of it, enjoying the best food ever (that I didn’t have to cook) and soaking in every inch to use in the third book of my Degrees of Darkness series, Revenge. New Orleans certainly is a setting that can be considered a character in any novel where the city appears. It has a life of its own and can mold or change any character that fictionally steps foot on its streets. 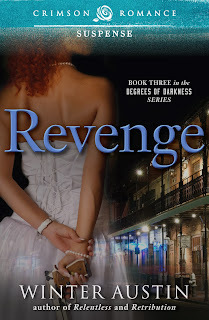 For my hero, Detective Remy LeBeau, New Orleans means death. On the opposite end, for my heroine, Cody Lewis, it meant learning what kind of woman she has become and it meant life. The gist of Revenge is spent in the city in a good portion of the places I visited. I was able to layer in much of the sensory details, probably better than in any book I’ve written before. The nuances of the city made their way into the story, as well as some oddities—like random people adding comments to the conversations of people passing by—happened on more than one occasion to myself and my friend. On the surface, New Orleans is a beautiful city, but if you look deeper than the surface you can see the ugly side. For years, authors familiar with the city have shown a side of it that not many know; ie... the corruption of public officials and the police force and the dangers that lurk on every corner. And that was the main plot of Revenge, corruption and greed is what destroyed Remy’s life there and drove him to seek his own vengeance for the wrongs done against him. Many of us remember what happened to New Orleans in the aftermath of Hurricane Katrina from what the news reporters showed us. But there were darker, more horrible things that never made it to the national news, and honestly this was nothing new for the people. A lot of the things I wrote for Remy to see from Katrina’s destruction impacted him greatly. And I can honestly say, a lot of the city remains in disrepair from the flood waters. But New Orleans is resilient, and so are the people. As I said, it’s a setting than can take over as a character all its own. And what a character! I can’t wait to go back. 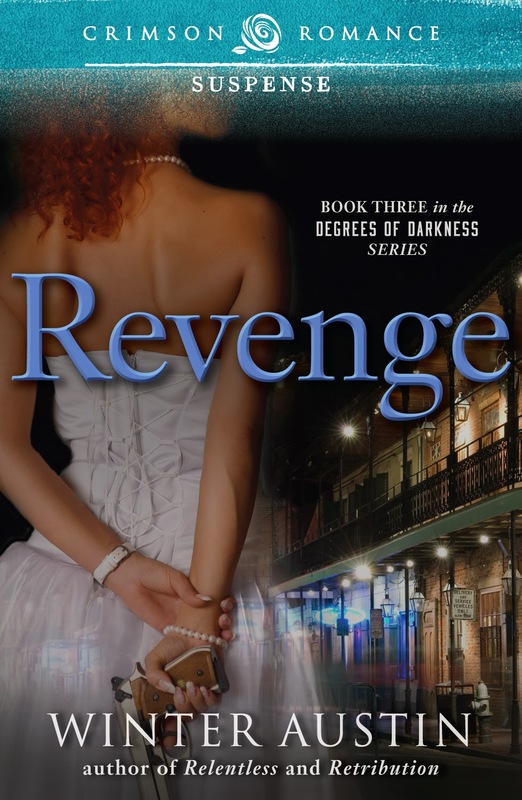 Winter is giving away 2 copies of Revenge, book 3 in her Degrees of Darkness series. The rapid succession of gunfire echoed through the firing range. When the last crack faded away, Cody Lewis flipped the safety lock and lowered her pistol. The Kimber Custom II Model 1911 .45 caliber had been heavy for her at first, but with the constant practice she was able to withstand the weight and the slight kick when firing. She swiped a loose red curl from her goggles then removed the plastic eyewear to squint at the furthest target. “I’d say so.” He let the binoculars hang from his neck and gave a thumbs up to the range supervisor. The humor disappeared from Heath’s features as he waited for the supervisor to give the all clear. Silence greeted her probing. A grim line appeared across Heath’s mouth. He’d avoided saying anything to her about Remy’s meeting with their lieutenant. And well, so had Remy. Cody didn’t know what the thing was about, why the two men were being so secretive about it, and if it involved her in anyway. The signal for all clear went out and Heath motioned for her to follow him across the grassy field to the targets. Keeping in step with him proved difficult. At the first paper silhouette, she grabbed the short sleeve of his shirt and jerked. Winter Austin resides in the mid-west with her Beta Hero, four mind-boggling kids, and a bevy of pets. When she’s not trying to kill her characters in some form or fashion she can be found in the kitchen creating another culinary delight. Giveaway ends 11:59pm EST Nov. 30th. Please supply your email in the post. You may use spaces or full text for security. (ex. jsmith at gmail dot com) If you do not wish to supply your email, or have trouble posting, please email maureen@JustRomanticSuspense.com with a subject title of JRS GIVEAWAY to be entered in the current giveaway. Thanks for the excerpt and book blurb. Revenge sounds so good. I love Remy already. Thanks, it's just a small taste of what's to come. Maureen, it was my favorite to write. Kimberly, I do, too, and I try to find other books set in the city. It really is a good city to use in novels. :) It was hard to pick a good one. Mary, it really is a start to a fast paced book.